Shilo Jazzman has great color and substance. Ever notice how depressing sale merchandise can be? Nice color but weird shape, or great style but horrible color? 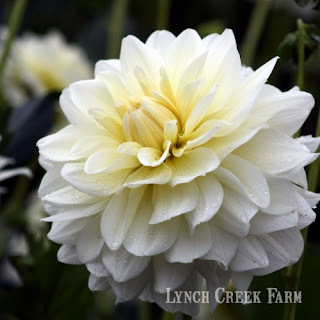 That's not the case with the featured dahlias currently on Lynch Creek Farm's website. Especially worthy of note is the big, beautiful white dahlia Shilo Jazzman. It's a B size, or medium, which in dahlia parlance means a bloom from six to eight inches across. It's kind of like beverage orders in a drive-thru where you order a medium drink and you get this huge vat of liquid that will barely fit into your cup holder and that will obviously keep you looking for the next rest stop all the way home ...but we digress. A six- to eight-inch dahlia blossom means a showy bloom, perfect for dramatic vases at home or for a church or wedding floral arrangement. And these dahlias are great for arranging. Shilo Jazzman has long, strong stems that hold up well in water. They hold up well in the garden, too, so this is a fine plant to add to the back of a mixed border — it grows to five feet — or make part of a dramatic dahlia bed. It has a nice, vigorous growing habit, and abundant flowers. You'll find it easy to grow from a fine, healthy dahlia tuber that will come to you at planting time from Lynch Creek Farm. What we like best about Shilo Jazzman is its color. It's a white dahlia, but a warm white, with a lemony cast to the bases of the petioles. As an informal decorative dahlia, it has a relaxed look but beautiful substance. And perhaps best of all, right now it's a "featured dahlia" at half price! What a dahlia! What a bargain! So Many Varieties: How Do You Choose a Dahlia? 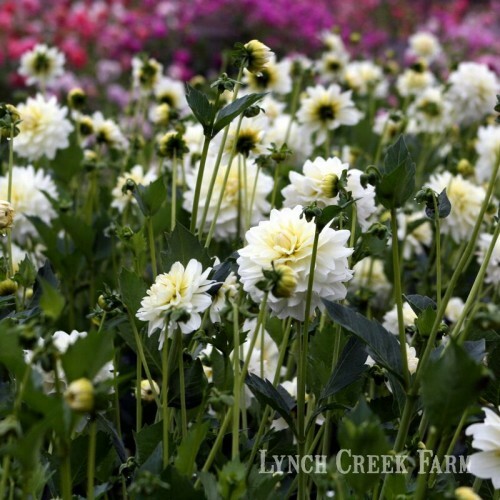 Overstock Dahlia Tubers: Bargains for Buyers!